There's An Amazing New Drug For MS Should I Try It? It wasn't long ago that there were no treatments for MS. In the 1970s, some doctors used chemotherapy to treat the degenerative neurological disease. Since then, more than a dozen drugs have been developed or approved, including infusions, oral medications and self-administered shots. None of these are a magic bullet for a disease that can be disabling and deadly. But now there's a new drug, Ocrevus, that looks like a game-changer. It uses a novel approach to blocking the inflammation that drives the disease, and looks like it's spectacularly effective. It also costs $65,000 a year. I have MS. Should I take Ocrevus? That, I discovered, is not a simple question to answer. But since I'm an MS patient and a science journalist, I was determined to try to figure it out. In March, the FDA approved Ocrevus (ocrelizumab) for the treatment of relapsing-remitting MS, the most common form of the disease. People with RRMS tend to have flare-ups when their symptoms worsen, followed by periods of remission, and in some cases a full or partial recovery. In two clinical trials sponsored by the drug's eventual manufacturer, F. Hoffmann–La Roche, RRMS patients who were given ocrelizumab had about 50 percent fewer relapses and up to 95 percent fewer new lesions on the brain and spinal cord than those who were given Rebif, a common therapy. MS is an autoimmune disease, meaning the body attacks itself. The body's nerve endings and the fatty tissue that coats them, called myelin, bear the brunt of the immune system's attacks. As a result, the central nervous system has difficulty communicating with the nerves, leading to a disease that manifests itself in different ways, such as pain, fatigue, disability and slurred speech. Historically, treatment of MS has focused on changing the way T cells, a type of white blood cell, decide which "foreign materials" to attack. "That's why the pathway to B-cell therapy took so long," says Dr. Stephen Hauser, who has studied MS for decades and led two key clinical trials to test Ocrevus. He chairs the department of neurology at the University of California, San Francisco School of Medicine. B cells, which are less numerous than T cells, are a different type of white blood cell involved in fighting infection, and these are the cells that Ocrevus targets. "Now that we look back," Hauser says, "we know that all of the other therapies work against B cells also. They are not selective for T cells." The fact that the previous therapies worked, Hauser says, was "fortuitous." Ocrevus is also the first FDA-approved treatment to target the more aggressive form of the disease, primary-progressive MS (PPMS), in which a person's condition worsens with few if any periods of remission. Another F. Hoffmann–La Roche-sponsored study found that Ocrevus outperformed placebos in patients with PPMS. Though the results were not as good as relapsing-remitting MS, Hauser says, it did slow the progression of disability and myelin lesions. I have had RRMS for more than 15 years and have taken Rebif, along with Avonex, a drug developed in the 90s. Now I'm taking Tysabri, a once-a-month infusion that works by keeping certain immune-related cells from crossing the blood-brain barrier. After talking to Hauser, who called Ocrevus "stunningly effective," I wanted to know: Why wasn't I making the move to this new drug? So I called my doctor, Scott Newsome, at Johns Hopkins Hospital in Baltimore. The answer was simple: "You're doing extremely well on your current therapy." He mentioned that my latest MRI looked good, with no new areas of demyelination, and although I was complaining about pain in my hands, I've been dealing with that for years. His biggest concern seemed to be safety. Ocrevus is a new drug, and even though all drugs carry a potential risk, he felt the known risks of Tysabri — including a big one that can it increase a person's chance of contracting a rare, deadly brain infection — are safer than those in a just-approved drug. Newsome also mentioned the potentially increased risk for cancer, particularly breast cancer, with Ocrevus. Though the rate of cancer in trial participants who had relapsing remitting MS was not statistically more than is expected in the general population, more trial participants receiving the treatment did develop cancer. Risk analysis is the overarching theme here. What's the risk that my symptoms will worsen? What's the risk that I'll die? What's the risk that I might develop antibodies to treatment? Or get cancer? "Patients need to be informed consumers and be part of the decision-making in my clinic," Newsome told me. "You really need people to be comfortable with the decision." But there are other factors to weigh, too, like convenience. After all, how effective can a treatment be if you can't actually make it to the doctor? "There are patients I have seen who've said, 'There is absolutely no way I can do monthly infusions,' because of time off from work, or maybe they live really far from an infusion center," Newsome said. For those patients, "We would strongly consider a therapy like ocrelizumab," which requires just two intravenous infusions per year. And then there is cost. Drugs for MS are expensive, and they're not getting any cheaper. According to Ge Bai, an assistant professor in the accounting department at Johns Hopkins University, it is the market that determines the price. The question to ask is: How high a price can the market handle? Other than that, Bai says, "There's no limit to what drug companies can charge." When she says no limit, she means it. Rebif, the medication against which Ocrevus was tested in patients with RRMS, has an annual price of about $86,400. The therapy I take costs about $78,200. So, at $65,000, Ocrevus is a steal, right? Not necessarily. 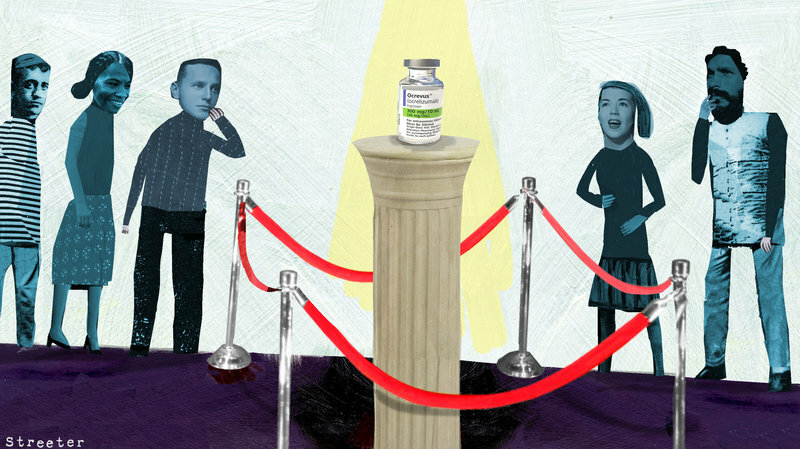 The cost of a drug is not necessarily a harbinger for what a patient will pay. Pharmaceutical benefit managers such as ExpressScripts or Caremark negotiate drug prices on behalf of insurance companies, getting a lower price for buying bulk, or simply getting word of the drug out, Bai says. One drug may have a higher price on paper, but after intermediaries, insurance companies or even special programs directly offered by pharmaceutical companies, it could actually be the cheapest option for a patient. In the end, choosing the right therapy for a complex medical condition involves a constant back-and-forth between patient and doctor. "When we see each other, and between visits," Newsome says — possibly alluding to my late-night questions to him online via MyChart — "We're always discussing, 'Is this the right treatment for you? Has something changed?' That is still paramount when it comes to taking care of you and others." So while I won't be switching to Ocrevus, other patients will. Hauser speaks excitedly about the potential of new B-cell-targeting therapies to ultimately wipe out all of the rogue cells that lead to MS symptoms — something that sounds almost like a cure to me.